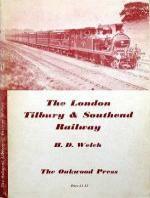 There has been much written about the London, Tilbury & Southend Railway. Here are a selection of those books and publications. (H) 8¾" x (W) 5½" (223 x 142mm). Softback in card covers. The Langloco Series Item 2. New edition with 48 pages and 19 black and white photographs. Originally published in July 1945 with 39 pages and subtitled Past and present, 1880 - 1944. (H) 7¼" x (W) 5" (183 x 125mm). (1951 edition). (H) 8½" x (W) 5½" (215 x 140mm). (1963 edition). Softback in card covers. The Oakwood Library of Railway History No. 8. 38 pages and 12 photographs, route map and table of locomotives. Originally priced at 5/- (25p). (H) " x (W) " ( x mm). Softback in card covers. Signal Transport Papers No. 1. 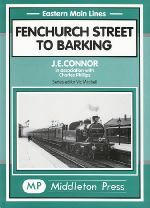 56 page historical account of the branch line between Romford and Upminster. Illustrated with diagrams, timetables and 16 black and white photographs. Originally priced 6/- (30p). (H) 9½" x (W) 7¼" (241 x 183mm). Hardback in dust jacket. 120 pages and over 180 black & white photographs. (H) 10" x (W) 7½" (252 x 192mm). Hardback in dust jacket. 196 page book with over 190 black & white photographs. 1988 edition originally priced £10.95. (H) 8¼" x (W) 5¾" (210 x 150mm). Softback in card covers. 138 pages, 75 scale drawings and 74 photographs. (H) 8½" x (W) 11¾" (214 x 297mm). Softback in card covers. (H) 9½" x (W) 6¾" (240 x 173mm). Pictorial hardback in laminated boards. Eastern Main Lines series. Writing by J. E. Connor in association with Charles Phillips. (H) 11¾" x (W) 8¾" (299 x 220mm). Hardback in dust jacket. 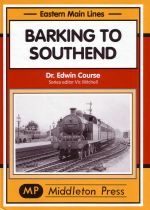 Eminent railway historian Bob Essery's exhaustive and possibly definitive account of the London, Tilbury and Southend Railway. 176 pages with 236 black and white photographs, numerous diagrams and maps. Eastern Main Lines series of books. 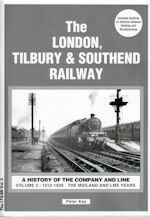 96 page account concentrating on the section of the London, Tilbury & Southend Railway between Barking and Shoeburyness. 120 black and white photographs, including 2 of Laindon, 2 of Basildon and 7 of Pitsea, plus various diagrams. Eastern Main Lines series of books. 96 pages, 120 black and white photographs and various diagrams. 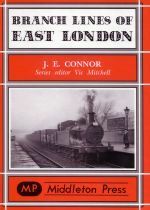 Eastern Main Lines series of books. Covers the original London & Blackwell Railway route. Volume Three: 1912-1939. The Midland and LMS years. 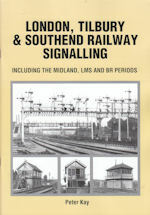 This book covers the Midland and LMS years. Fully illustrated, 92 pages. Ivor Gotheridge's account of this little known industrial line initially built to serve the Kynoch explosives factories on the banks of the River Thames in Essex. Covering a distance of just over 2¾ miles, the line was built to standard gauge and steam operated for its entire life. Two stations were provided; Corringham and Kynoch Town (later renamed Kynochtown and from the 1920s Coryton), and access to the main network via a triangular junction and short spur which linked the line to the Thames Haven branch. 56 pages and over 40 photographs detail the lines history from its opening in 1901 (Goods: 01/01/01; Passengers: 29/06/01) through to closure on 1st March 1952. Comprehensive history of the former line, including Kynoch's works Kynochtown/Coryton and the oil industry. A must visit website with recent updates concerning the Corringham light railway project which hopes to create a heritage walk on the remains of the former track bed. (H) 8¼" x (W) 11¾" (209 x 297mm). Softback in card covers. Essex Branch Line and London Shipping Link 1835-1996. 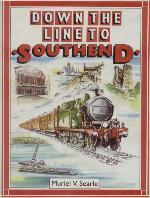 A further volume in the history of the London, Tilbury & Southend line. Description: Nine page article, beginning on page 338, of 'Locomotive stories' on the London, Tilbury and Southend Railway. Two pages of black and white photographs (6) + one additional photo on opening text page. Description: Part one of a 3 page article covers the early history with detail given to the various acts passed. Some of the writers own memories are included. There are no illustrations accompanying this article. Description: Part two concludes the story with 5 pages of factual information and personal memories. Five black and white photographs accompany the text. Description: Seven page article, beginning on page 116, about the resignalling of the London, Tilbury and Southend Railway. Eight period black and white photographs, two being of the interior of Laindon signalbox, plus a line layout diagram. Description: First part of a 6 page article covering events on the line since the Second World War. Illustrated with 7 black and white photographs. Description: Part two of the March 1962 article has a further 5 pages bringing the story up to date. Illustrated with 4 black and white photographs, and a line speed chart. Description: Single page account on the locomotive pulled coaching stock of the London, Tilbury & Southend Railway. Incorporating notes by P.I. Paton and featuring an additional page of 12 black and white photographs of L.T.S. coaching stock. Description: 5 page article detailing the construction of the new 'direct' route between Barking and Pitsea, which opened in 1888. 12 black and white photographs, including two of the newly opened Basildon station in November 1974. 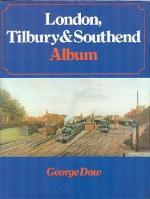 Description: 9 page account of the history and early years of the London, Tilbury & Southend Railway. Illustrated with 12 black and white photographs, including one of the platforms with Pitsea Junction signboard clearly visable. Description: The second part of Ken Frost's history of the Tilbury line. 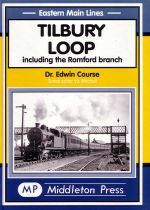 This 8 page account covers the Midland Railway takeover, electrification, Basildon railway station, and other notable events through to the closure of Tilbury Riverside in 1992. Fully illustrated with 10 black and white photographs. 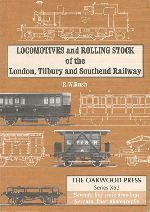 Description: Entire 46 page edition devoted to the Locomotives of the London, Tilbury & Southend Railway with text from Peter Rowledge. Seventy four black and white photographs, and two colour shots, with detailed information accompanying each photo. Fenchurch Street to Shoeburyness via Bow Junction, Stratford, Forest Gate, Barking and Upminster. Filmed journey from the cab of a Class 302 (slam door stock) from Fenchurch Street to Shoeburyness via Bow Junction, Stratford, Forest Gate, Barking and Upminster on the Network SouthEast operated line, in the 1990s. Also stopping at West Horndon, Laindon, Basildon, Pitsea, Benfleet, Leigh-On-Sea, Chalkwell, Westcliff, Southend Central, Southend East, Thorpe Bay and terminating at Shoeburyness. Total running time: 61 minutes. Format: VHS (Pal). Filmed journey from the cab of a Class 302 (slam door stock) from Southend to Fenchurch Street on the Network SouthEast operated line, in the 1990s. Stops include Westcliff, Chalkwell, Leigh-On-Sea, Benfleet, Pitsea, Stanford-le-Hope, East Tilbury, Purfleet, Barking and terminating at Fenchurch Street. Total running time: 71 minutes. Format: VHS (Pal). Filmed journey from the cab of a Class 357 Electrostar - in original white and green livery - from Fenchurch Street to Southend Central via Upminster and Grays on the C2C operated line in March 2002. Calling at West Ham, Barking, Upminster, Ockendon, Chafford Hundred, Grays, Tilbury Town, East Tilbury, Stanford-le-Hope, Pitsea, Benfleet, Leigh-on-Sea, Chalkwell, Westcliff, and terminating at Southend Central. Live sound, no commentary. Total running time: 66 minutes. Format: VHS (Pal). Filmed journey from the cab of a Class 357 Electrostar - in original white and green livery - from Shoeburyness to Fenchurch Street on the C2C operated line in March 2002. Stopping at Thorpe Bay, Southend East, Southend Central, Westcliff, Chalkwell, Leigh-On-Sea, Benfleet, Basildon, Upminster, Barking, West Ham and terminating at Fenchurch Street. Live sound, no commentary. Total running time: 55 minutes. Format: VHS (Pal). Text written 2005 with revisions 2006-2007,2010. Copyright © 2005-2007,2010, Basildon History Online. All rights reserved.